Feb 2, 2017 – Washington D.C.
After the Prime Minister responded that in fact, “Kiwi” is a colloquial term for people from New Zealand, not Australia, and that the Bloomin’ Onion is only US $8.49, which is about AUS $11.23, President Trump accused Australia of manipulating its currency to make the whole range of Outback’s “Aussie-Tizers” less affordable for middle-class Americans. 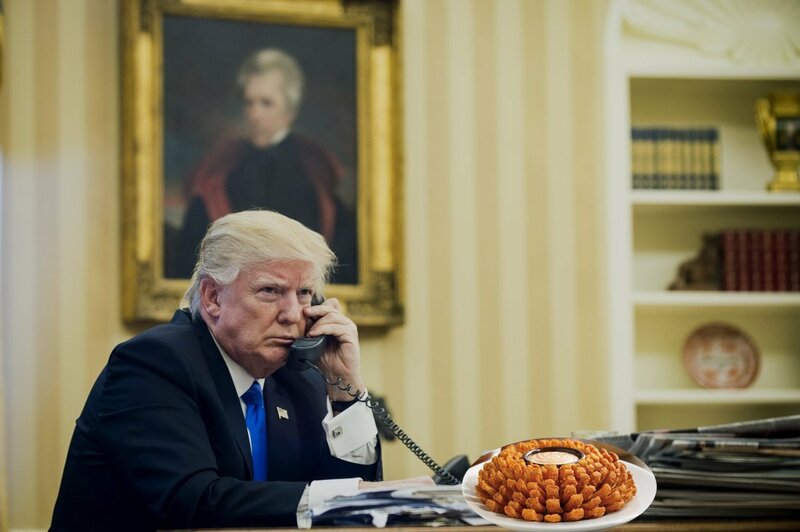 When Turnbull responded that Outback is not even an Australian company, but a franchise founded in Tampa in the 1980’s, Trump accused him of lying about when it’s summertime down under, and threatened that the U.S. would build an “Even Greater Barrier Reef” in the Pacific, and vowed to make Australia pay for it. Previous Previous post: Trump Explains His Relationship with Putin…. Next Next post: Washington Post: Trump exposed top secret intel to the Russians in the Oval Office, the day after he fired Comey for investigating his collusion with the Russians.